Can’t breathe without Helvetica? We know the feeling. If typography gets you out of bed in the morning, Designer and Creative Technologist Dong Yoon Park has created an app for you. 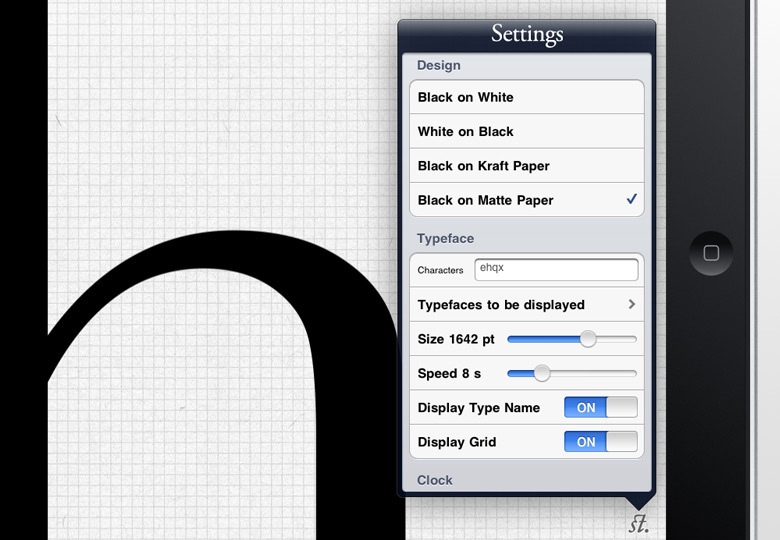 The TypeClock app features four different types of design, the ability to assign characters displayed, change type size and animation speed and grid mode. Design Options include Black on White, White on Black, Black on Kraft Paper, Black on Matte Paper, Display Type Name and Display Grid. Typefaces provided by iOS include Cochin, Times New Roman, Palatino, Hoefler Text, Didot, Bodoni, Baskerville, Georgia, Arial, Verdana, Futura, Gill Sans, Optima, Trebuchet and of course, Helvetica. Download it here ($.99). Want to know what fonts are used in some of the web’s most famous logos? Read here.